Making the move from a family home to a retirement village unit, assisted living, serviced apartment or residential care home is stressful, and many times overwhelming. Any relocation, whether just around the corner, to the next suburb, or to another State needs to be carefully planned. Trying to downsize any household is emotionally and physically demanding - most of the possesions having a sentimental attachment. Would your relative or friend welcome a caring and experienced senior relocation consultant to provide assistance ? The team at Senior Moves are caring and experienced professionals available to assist with your elderly loved one's transition. 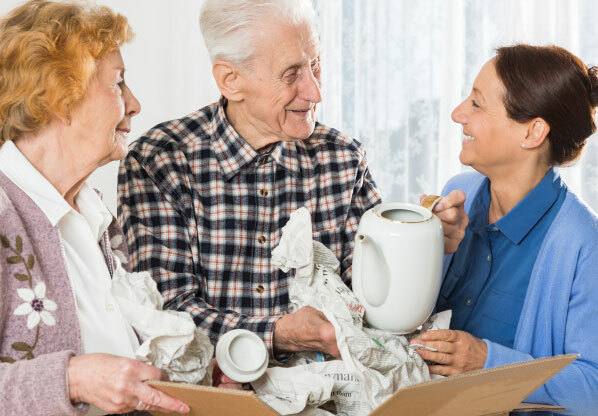 We have been helping senior members of our community move to new accommodation since 2002 and we are experienced in arranging a stress free move for your relative or friend. We offer a reliable, efficient, and price competitive senior relocation service. Request a Free no obligation first meeting - One of our experienced senior relocation consultant will visit you to help build the moving plan. Your own tailored quote - During the initial meeting, we will explain our specialised services and develop a tailored quote for the tasks to achieve your specific needs. We will subsequently discuss the quote and your prereffed timetable with you before proceeding with the work plan. We work to your requirements - Our services are available for a range of requirements, including moving from the family home to a retirement village, serviced apartment, assisted living or residential care home. Whether you are moving to a retirement village, independent living unit, assisted living apartment, supported residential service or residential care home there are many items to consider and to plan for. How much furniture will I be able to take ? Can I take my own bed and comfortable chair ? What is the floor plan and layout ? Will my furniture fit in ? We have a wide understanding of the concerns and tasks that need to be completed and we can do the work for you. This means that you can focus on the emotional and personal needs of your relative during the transition time. We reduce the emotional stress relating to relocating to a retirement village, assisted living apartment, supported residential service, or high care nursing home. SENIOR MOVES can assist you to organise your home or office. Would you like a fresh set of eyes and a willing set of arms and legs to help you get organised? A messy and disorganised home or office can reduce your productivity and affect you on an emotional level. Are you required to manange a deceased estate? Do you need to look after their physical belongings, including the family home? SENIOR MOVES is able to assist you with the work involved with deciding what to do with person belongings. We can have the premises organised and vacated to your requirements, whether it is for sale or for future use. Why Choose Senior Moves ?